This document covers how to connect devices to the UWGB-NetReg network. This network is designed for devices that cannot connect to the more secure networks (eduroam/UWGB Wireless) such as printers, TV’s, gaming consoles, Apple TV’s and more. You can use your computer, tablet or smart phone to register your device as well as sharing it with your roommate if you want. This network is only for registered devices (printers, TV’s, gaming consoles, Apple TV’s) and will only provide internet access to these devices – computers, tablets, and smart phones will not have internet access through UWGB-NetReg they must use eduroam or UWGB Wireless. You can have up to three devices registered to your name. Note on Roku's: Another way to find the MAC Address on a Roku is to go to Network, then click on Scan Again, and the MAC Address will show up on that screen. Note on gaming: For high performance gaming use the wired connection in Res Halls when available. You will need a standard ethernet cable for this option. Printers are only allowed to be used on the wireless network if registered and connected to NetReg (NOT Eduroam or Guest). Register a printer for NetReg here! If you've registered your printer online and connected to NetReg, it still does not work, then you will need to turn off the wireless settings option and the WiFi direct setting. Even if your printer is turned off completely, if the WiFi direct setting is on, then it will still interfere with the network, causing problems for other people in the building. You can go to HouseIT in the bottom of the Community Center for a free USB cable to connect your printer to your computer directly, instead of using wireless. As far as we are aware, Epson printers will not work on our network. Printer support on NetReg is expected to be improved in the summer of 2018. You will not need to re-register your device each time you connect it after it has been registered and connected once. Each device will have a slightly different registration process for finding its MAC Address. 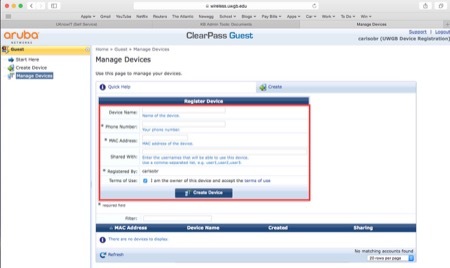 Use the links here to find your devices MAC Address before you start the registration process. If you do not see your device listed below, you can search on Google for how to find the MAC address for that specific device. It is usually located in the network settings or device information menus. 1.) 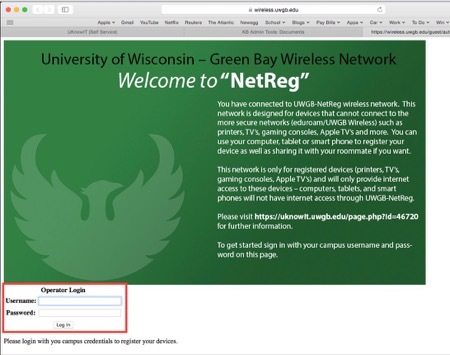 Navigate to the UW Green Bay NetReg page on a device already connected to campus wireless. 2.) Sign in to the page with your campus account. 3.) Click "Create" This will make a new device record. 4.) Fill the form out with your information and device details. NOTE: The "Shared With" field would allow you to share the device with friends or roommates. 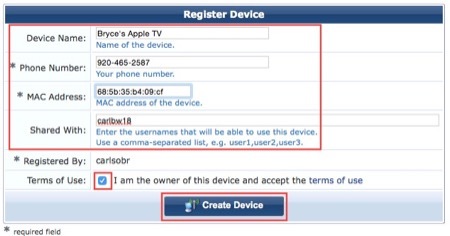 For example, if you have an Apple TV, but would like your roommate to also have the ability to AirPlay (More on what AirPlay is here: https://www.apple.com/airplay/) to the AppleTV just simply add their campus username to the shared with field. In our example here we are sharing the AppleTV with carlbw18. 5.) With all fields filed click the "Create Device" button. Your device is now registered. Wait 15-20 minutes and reboot the device twice. When it turns back on you will be able to connect and use the NetReg network. 6.) Enjoy your device, or if using a printer with NetReg, add it to your computer now.